Five sponsorship levels (along with trade and door prize sponsorships) are available to meet the budgetary requirements of your marketing strategies. 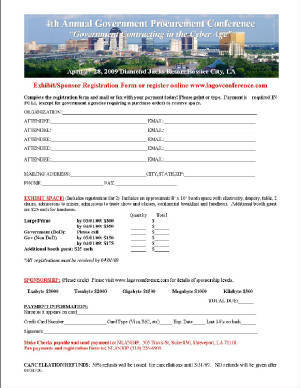 Purchase a Sponsorship Online Here! NLANIGP, 505 Travis St, Suite 850, Shreveport, LA 71101 or fax to 318-226-6909. The Northwest Louisiana Procurement Technical Assistance Center is a joint initiative of the Defense Logistics Agency and the Greater Shreveport Chamber of Commerce.